The market approach aims to establish the value of a company based on how similar firms are priced on the stock exchange or through company transactions. Using the market approach, price-related indicators such as price to earnings, sales and book values are utilised. An ever-present problem however, is that different valuation multiples and valuation methodologies tend to provide the analyst with contradictory outputs. The solution to this problem so far has been to claim that the market approach is more art than science, thus providing the analyst with the freedom to alter the multiples at their own discretion to reach a uniform value or range. 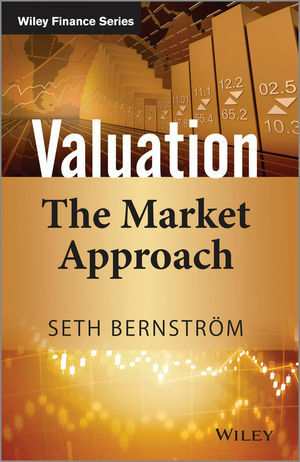 Valuation: The Market Approach puts an end to this problem, providing the reader with a rational scientific-based understanding and the necessary tools to perform a sound market approach valuation, or if reviewing such valuations, provide the tools to challenge the work of the arts-based senior experts. The book begins with an in-depth review of the basics; which is then applied in a detailed worked example. Step-by-step, the reader’s expertise is built towards a complete understanding and implementation of the market approach, not only on a standalone basis but also in relation to the DCF methodology. SETH BERNSTROM is a Director at the Valuations practice of PwC. He has 15 years of experience as a valuation expert with a special focus on private equity, with long-running engagements in Valuation for some of the leading Nordic private equity houses. Additionally, he provides valuation support and valuation-related advisory services to large and medium-sized Nordic and (Nordic-based) global companies. In addition to his regular work at PwC, he also acts as Visiting Lecturer on valuation at KTH Royal Institute of Technology in Stockholm. Furthermore, he often gives lectures and seminars on valuation at other leading Nordic universities, investment banks, companies, and organizations. He holds a Master of Science in Business Administration and Economics from the Stockholm University School of Business.